As a happily married man, on the odd occasion that I do take my wedding band off, I somehow feel a little guilty about doing so. I was perusing a car forum the other day, and noticed that there was a whole several page discussion among guys as to what the correct “protocol” was for when to wear a wedding ring. While there is no such thing, there are a number of different reasons why guys will take off their ring, and some of them are to do with their initial choice in wedding band material. 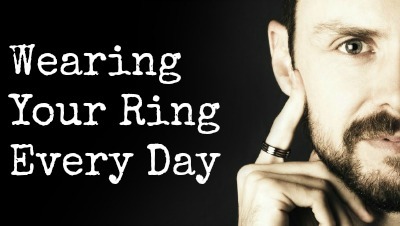 Probably the most common reason for taking the ring off is due to going to the gym. If you’re lifting weights, depending on the material your ring is made of, and can very easily damage the ring. This really can be applied to any form of heavy lifting too, like when you’re moving house, or working on the car. If you have a soft metal ring like gold or silver, these can bend, scratch and dent (and this also applies to any ring which has a soft metal plating or inlay, like tungsten inlaid with gold, although the ring itself won’t dent or bend). Metals like steel and titanium won’t dent or bend, but may still scratch, and tungsten and zirconia won’t dent, bend or scratch. Of course, this doesn’t mean you shouldn’t buy the ring that you want, but it should gve you a clearer idea of whether you should take it off or not. Another problem some men have is that they simply don’t like the feel of a wedding ring on their finger, and like to take it off when they can. While I don’t profess to be any kind of marriage counsellor, having your wife see you constantly not wearing your ring may be hazardous for your health. The best thing you can do in this situation is wear a light material like titanium or ceramic, and stay away from tungsten wedding rings, as these are quite heavy. Titanium and ceramic rings are so light that pretty soon you won’t even know you’re wearing it. Finally, if you have a silver or lower karat gold ring, you might notice discoloration over time, that accelerates when you sweat (particularly during exercise). This is most often due to the copper content in the metal, that is used to strengthen the ring. This can not only cause discoloration of the ring itself, but also of your skin. This can also happen when swimming at the beach or in a pool. Platinum, palladium, titanium, tungsten, ceramic and steel definitely won’t discolour in these situations. It’s always best to keep your ring on as often as possible, as it’s when you constantly take it on and off that you most risk losing the ring, and that won’t make for a happy wife. Remember, happy wife equals happy life!